There are always those days when you really feel like you need something a little…classy. The stand by hamburger helper or spaghetti just won’t cut it. 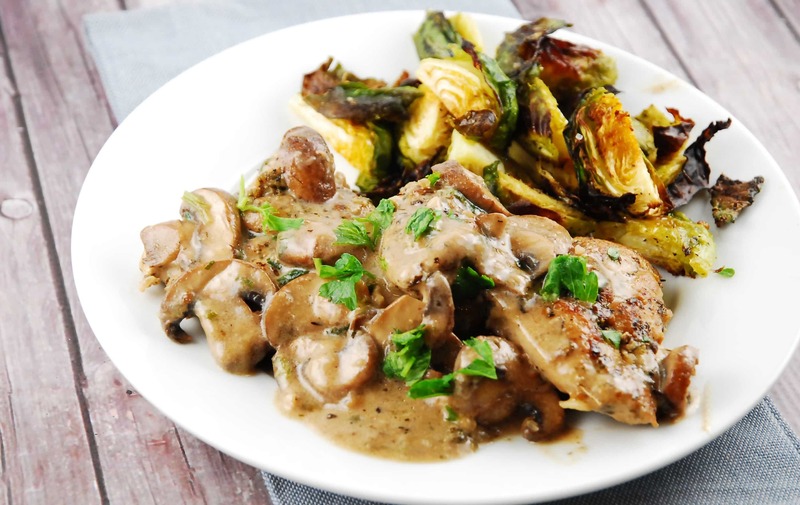 Whenever I feel like I need a little bit of a fancy dinner, I whip up this Italian Herbed Chicken in a Creamy Mushroom Wine Sauce. Let me tell you, it’s just the ticket. I had something similar once at an Italian restaurant in Los Angeles, and I was blown away by how rich and flavorful this dish was. It was so good that it immediately went on my list to make a healthy, but equally delicious, knock off recipe. One of the things that I almost always have to do when I make a knock off recipe is to lighten it up. My goal always to lighten the recipe without sacrificing the flavor or feel of the dish. You know what I mean…there are just those dishes that feel decadent. Now, I might have lightened this up, but I was definitely keeping the red wine sauce. First of all, I love ANY sauce with red wine in it. Seriously, I will just eat it all up with my spoon…and then lick the plate (if I can get away with it). If you don’t like to cook with alcohol, that’s fine, but you should know the sauce won’t be quite as rich and delicious. Red wine adds a depth of flavor that you really can’t get with chicken broth. First, red wine sauce, next, a red wine sauce simmered with milk and parmesan cheese. It’s heavenly. Of course, most of the time, cream sauces are made with heavy whipping cream. But since I didn’t feel like blowing my entire day’s Points on one sauce, I lightened it up a bit. I used reduced fat milk (2%) and a little cornstarch to achieve the same consistency and flavor as the cream. The advantage is that it’s got a LOT less saturated fat and calories. Plus, many of us keep a reduced fat milk on hand, so you don’t have to get special ingredients for one recipe. The sauce is just made better by the fact that you deglaze the pan you cooked the chicken in. The chicken is seasoned liberally with basil, oregano, thyme and parsley. Seasoning the chicken and then cooking them allows the seasonings to flavor the chicken. But, there’s always a little left in the pan afterwards. When you deglaze the pan with the wine (after sautéing the garlic and mushrooms), you get to keep all those delicious flavors from the spices and pan-fried chicken. My kids ate this over steamed rice, with a side of roasted brussel sprouts. It was sooooo good! It’s not the fastest meal you can make, since it takes a little while to cook up the chicken and then cook up the sauce but trust me – it’s worth every minute. If you want to up your chicken dinner game, try this Italian Chicken in a Creamy Mushroom Wine Sauce. You’ll wow your whole family! Need some more healthy chicken recipes? Tender, juicy chicken thighs sautéed in Italian herbs, and simmered in a velvety, creamy wine sauce that has been dramatically lightened up while still tasting incredibly decadent. In a large bowl, toss chicken thighs with 1 tbsp olive oil until evenly coated. Add in the dried basil, oregano, thyme, parsley, and salt & pepper. Toss well to coat. Heat remains 1/2 tbsp olive oil in a large skillet over medium high heat. Add in the chicken, and sear chicken thighs until golden and crispy on each side (about 3-4 minutes each side). Transfer the skillet to the oven, and roast until chicken is entirely cooked through, about 20-25 minutes. Remove chicken from skillet, leaving the juices in the skillet, and return skillet to medium high heat. Sauté the garlic in the pan juices for about 1 minute, then add in the mushrooms and a bit more salt. Cook until the mushrooms begin to soften a bit. Add in the wine, and sauce until wine reduces by half. Reduce heat to medium, and pour in the milk. Bring to a gentle simmer, stirring occasionally, and being careful not to boil. Mix cornstarch with 1 tbsp of water, and pour it into the pan, and continue to simmer while quickly stirring the mixture through until the sauce thickens. Add in the parmesan cheese and allow sauce to simmer for a further minute until cheese melts throughout. Add the chicken back into the pan and allow to simmer for another 1-2 minutes. Sprinkle parsley over chicken, and serve. It really would be nice to be able to print this without all the extra information for us compulsive people. I have printed from your site before so maybe it’s just this recipe. Great recipe. this website is nonfunctional as far as printing goes…. your print button hasn’t worked for months! people are commenting and you don’t have the manners to even acknowledge our comments! That’s simply RUDE!!! If you can’t fix the problems with your website, get off the internet!! This is really annoying!!! What would you recommend as a substitute for the red wine? I don’t drink and would rather not buy a whole bottle for just a half cup. Thanks! You can try using chicken stock as a substitute, or I’ve even heard (not tested!) that you could use grape juice by mixing the grape juice with 1 tbsp of white vinegar for every cup of juice. The flavor that the red wine gives is so worth it though! If you choose to buy the bottle of red wine, you can pour the unused portion into an ice cube tray, freeze it, then store the red wine cubes in a ziplock bag in your freezer so that you have its on hand for other recipes in the future! I have enjoyed every recipe I have tried from LaaLoosh and many are on our regular rotation. I just wanted you to know how much I appreciate your generosity! I will definitely be making this one soon! For those having trouble printing, just copy/paste recipes into a Word document and then print, making them not being print friendly a nonissue. And you are so correct ~ the WW recipe builder has never been known for its accuracy. I am having trouble printing this one. Only displays he intro paragraph. Your print button hasn’t worked properly for months. Clicking on print friendly only offers the photo and description, no list of ingredients or directions. Any idea on when it will be operational again? Love your recipes and used to print several of them. I have found several of your points to be incorrect according to WW online site. Today’s recipe per WW website would be 9 points. This will depend on the nutritional info of the specific ingredients you use. I record the data from the packages of all of my ingredients, and then enter the totals into the calculator. I do not rely on the WW recipe builder, because in many cases, it utilizes a generic data input for the ingredients (unless I enter a specific brand that is listed in their database). Therefore, I find it to not be too reliable. One brand of chicken thighs may have a lot less fat/calories than another brand, even though they are both skinless, boneless chicken thighs. To get the most accurate Smart Points value, I highly recommend adding up all the nutritional info from the specific brands of ingredients you use.